John Culver worked on a variety of projects including setting up a real-time electricity dashboard useful for monitoring demand response events. 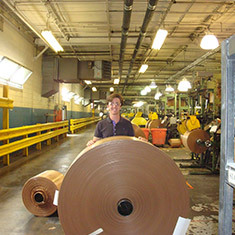 Hilex Poly hosted EDF Climate Corps fellow John Culver to help design and implement focused energy efficiency projects to deepen its commitment to reducing its carbon footprint by reducing energy consumption at its North Vernon facility. Initially, Culver conducted an assessment of the energy consumed during the production and transportation of Hilex Poly’s recycled plastic retail bags. He identified that 67 percent of energy was consumed at the plant while the remaining 33 percent was transportation related. Next, Culver identified multiple projects capable of reducing energy consumption. The first short-term project was the opportunity for replacing high intensity discharge lights with more efficient LED lights. Over their lifetime these retrofits could save more than 20 million kilowatt hours and more than $2 million in net operating costs. Culver also worked to develop a long-term proposal to install a solar photovoltaic system on the roof of Hilex’s two conjoined facilities. Working alongside outside vendors, Culver identified the potential for a one megawatt solar system capable of annually generating more than 1.5 million kWh of electricity and providing over $3 million in revenue in its lifetime. A system of that size and productivity is the equivalent to powering over 3,000 homes for a year and would offset over 33,000 metric tons of carbon. Lastly, Culver worked with Hilex Poly’s utility company to set up a personalized energy management profile that had an immediate impact on energy consumption. This online dashboard allows Hilex Poly’s leadership team to accurately observe their real-time electricity consumption and react to demand response events, which used to cost them thousands of dollars each month but now earns thousands. John Culver, student at Duke University, was hired as the 2013 EDF Climate Corps fellow at Hilex Poly.